Face it: the real world is often mercilessly dull. It’s therefore no surprise the notion of escaping to another reality – one where you can live out your wildest fantasies – is becoming increasingly more seductive as virtual reality technology grows by leaps and bounds. Sword Art Online envisions a future where virtual reality gaming is so commonplace engaging a gargantuan dragon in combat is as easy as flipping a switch. It’s precisely for this reason the media franchise is one of Japan’s most popular – it gives us hope that we could be enjoying such life-affirming adventures within a few decades’ time. 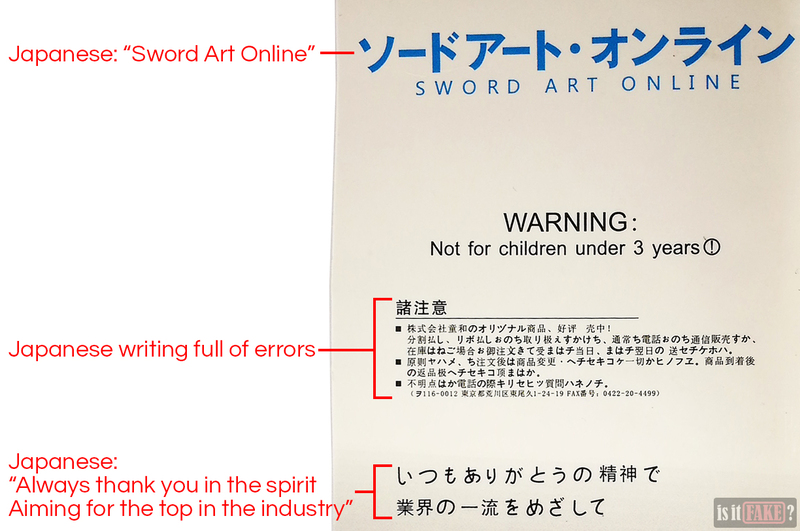 Sadly, Sword Art Online’s fame has also given a multitude of bootleggers hope that they can make a quick buck tricking unwary fans into buying their inferior products. It’s no exaggeration to say that so far, it’s been working out for these pirates; otherwise they would’ve already stopped manufacturing fakes such as the two Sword Art Online crystal pendants we’re discussing today. While not all sellers on eBay are unscrupulous, many ruin things for everyone else by hawking low-quality counterfeit items to clueless consumers. 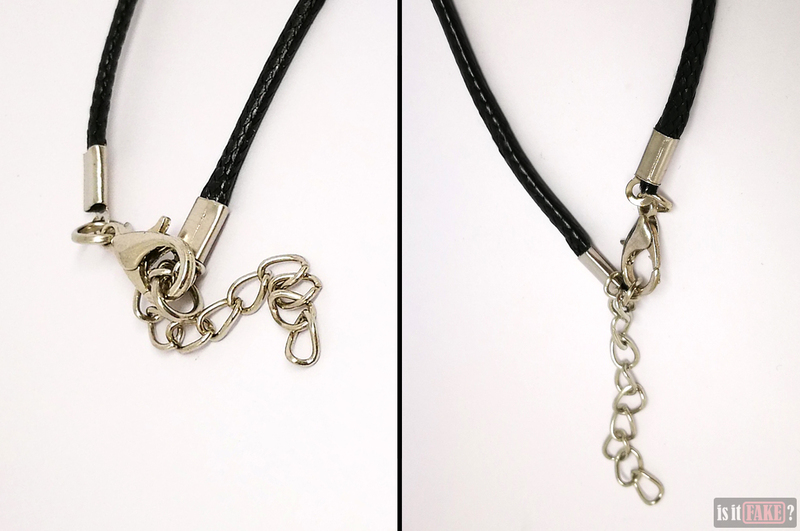 From two different sellers, we bought this pair of fake Sword Art Online pendants. 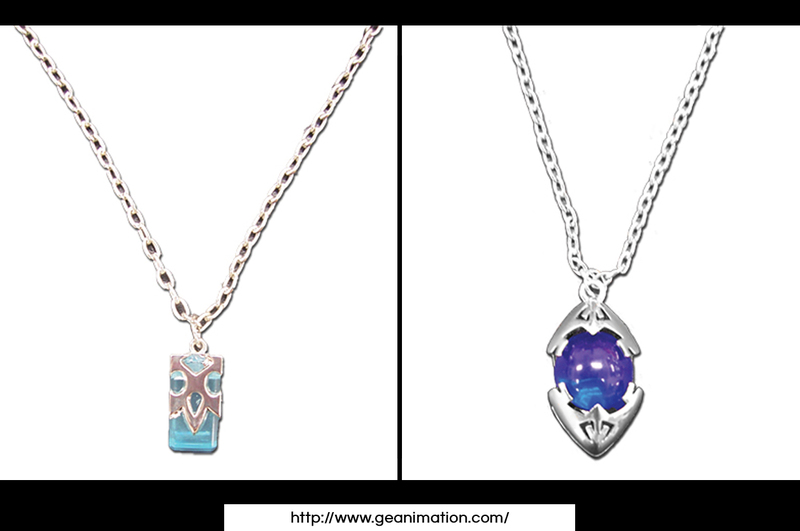 The blue crystal pendant was manufactured by Xin Yuan Animation, which, according to Chinese online stores, is a Chinese company engaged in the production of peripheral goods. 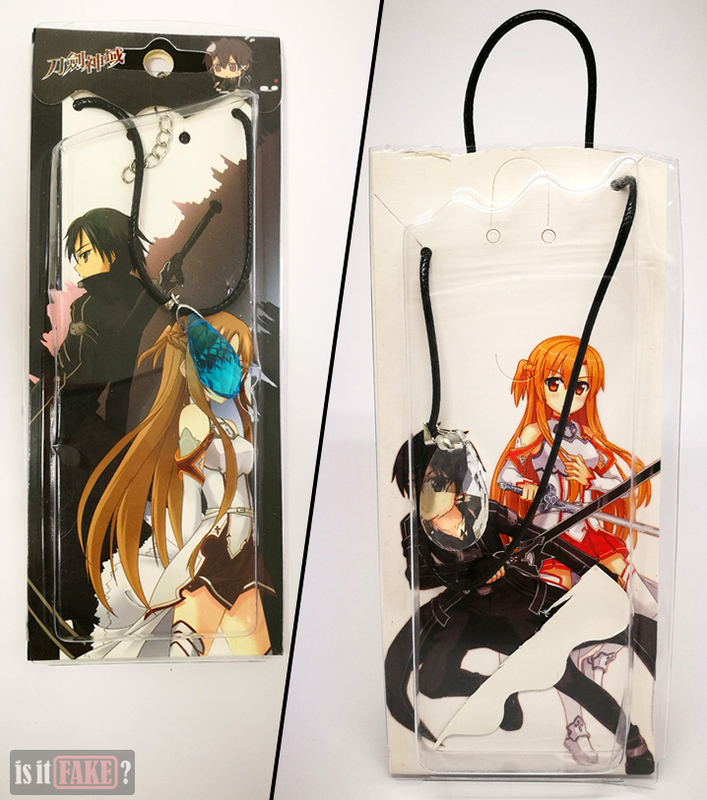 There’s no evidence said company acquired the rights to produce Sword Art Online merchandise. In fact, there’s barely any information about Xin Yuan Animation on the internet – highly suspicious indeed, given that the internet is swimming in oceans of data concerning licensed manufacturers and distributors of anime products. 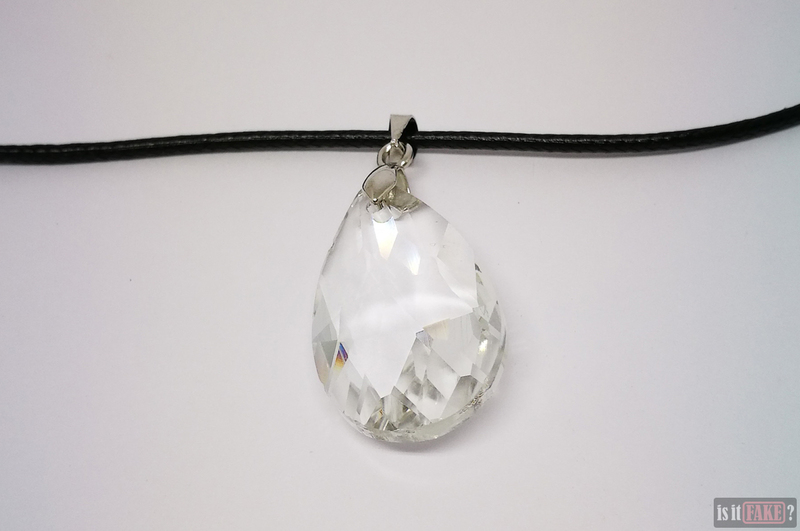 As for the clear crystal pendant, its manufacturer seems to be an entity called Star, whose name and emblem can be seen on the item’s packaging. There’s even less information about Star on the internet, so that should immediately set your alarm bells ringing. That’s one rule to remember: law-abiding companies are often extremely forthcoming with information about themselves and their licensed products. Anyone doing the opposite is up to no good. 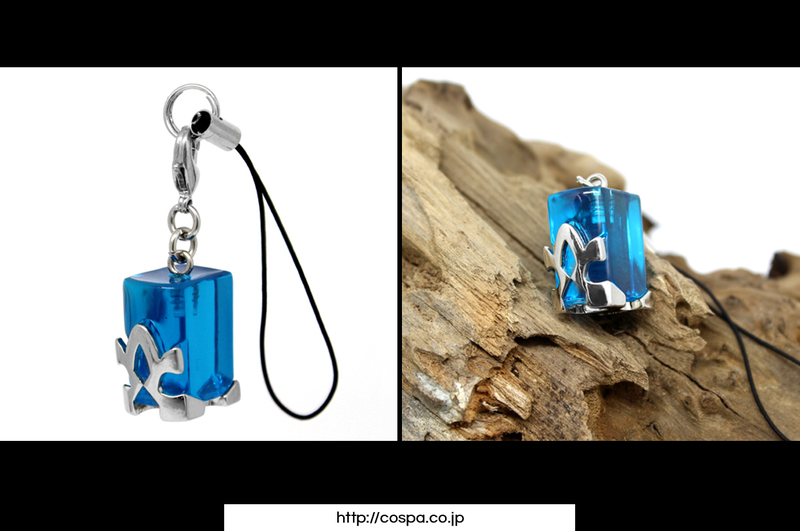 The fake Sword Art Online blue crystal pendant comes in packaging composed of cardboard and a transparent plastic shell. The plastic shell is deformed; none of its sides are perfectly straight. It’s also damaged, with the sharp bumps and dents in the middle making it look as if someone had bent the entire packaging in half. Said shell doesn’t fit well over the cardboard. Its opening on top is fairly spacious, not only allowing the cardboard to slip out with little effort, but dust to enter easily, as well. The cardboard also doesn’t have straight sides, as if it was clumsily cut out of a larger piece of cardboard. 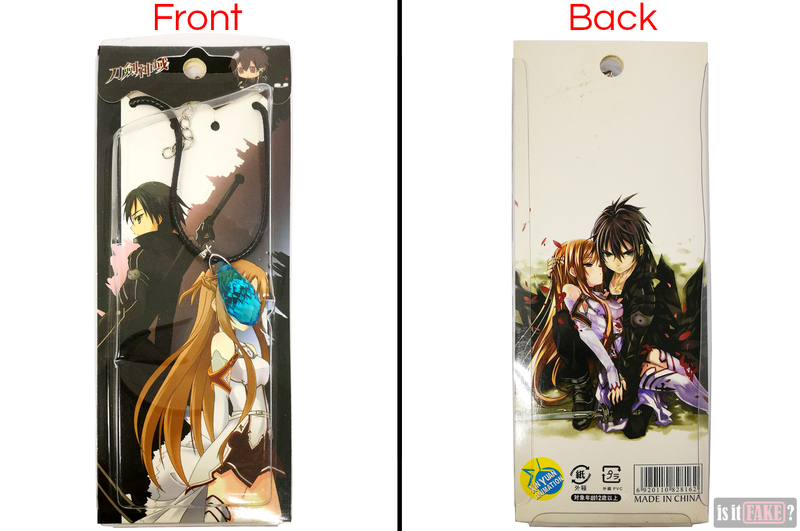 Featured on both the front and back side of the cardboard is Sword Art Online fan art. The anime boasts a distinct art style. Its characters are distinguished by large, rounded eyes, chubby cheeks that form a smoother curve down to the chin, and often a wide gap between the nose and lips. These characteristics are not reflected in the art on the front of the packaging, proving they’re not official art. As for the art on the back of the packaging, it’s far too detailed. The hair, in particular, is embellished with numerous sharp shadows and highlights. 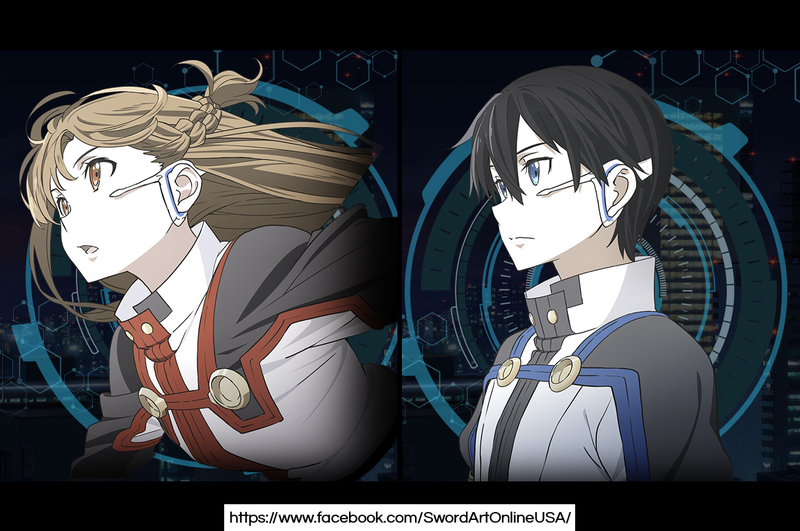 Official Sword Art Online art is rarely this complex; its appeal is not in its intricacy, but in its moe factor. 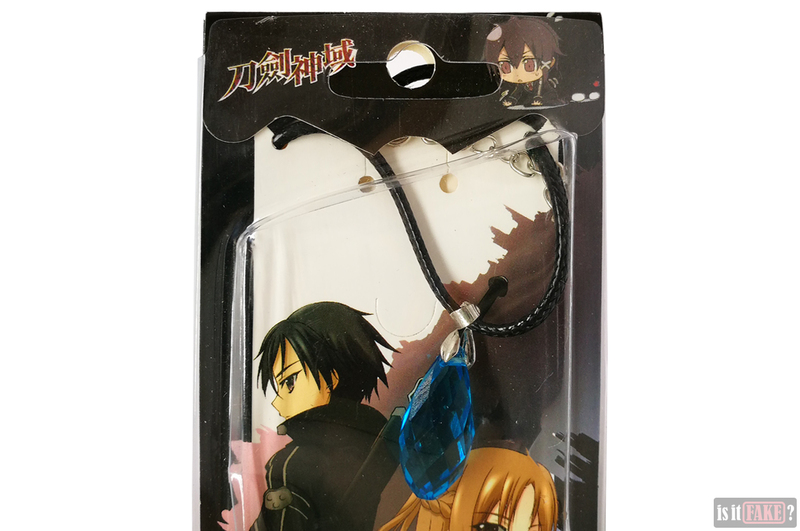 Legit Sword Art Online merchandise would have used official art, so the presence of fan art on this pendant’s packaging makes the whole thing highly suspect. Not to mention the print quality of the pictures isn’t great. We see other hints of fakery on the cardboard. 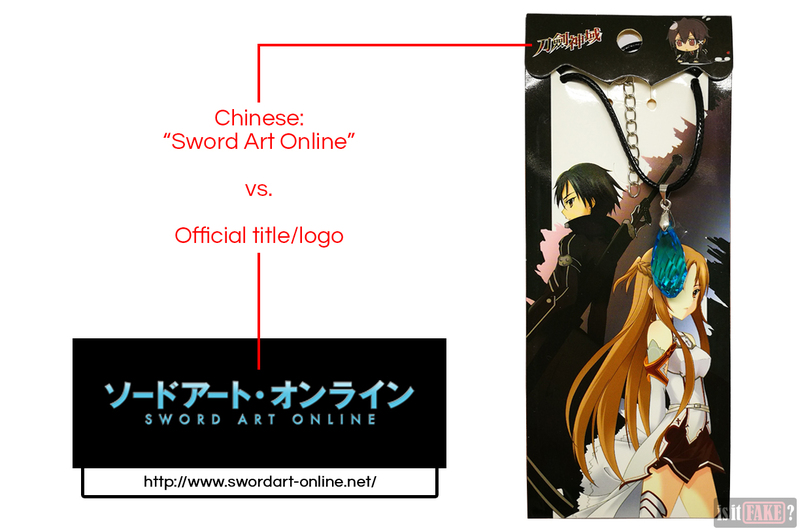 On the upper left corner of the front side, we see “Sword Art Online” in Chinese. The font is extremely stylized and doesn’t match the clean, uncomplicated look of the official title/logo. On the back, we see the logo of the aforementioned Xin Yuan Animation. The barcode, when scanned, doesn’t yield any data even remotely connected to this product – a huge red flag, as an official product would have a barcode that would lead directly to it. 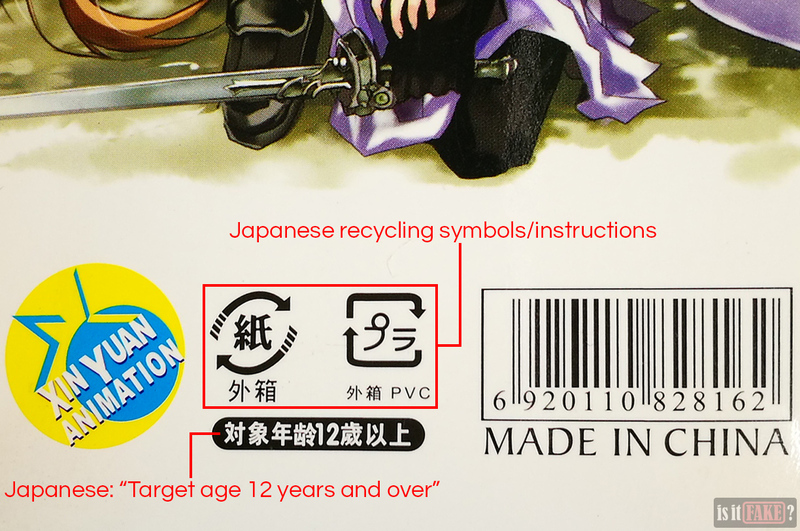 Japanese characters and recycling symbols were added to the back to make the product look legit. Too little, too late, though. And we’re not even done with the review yet. 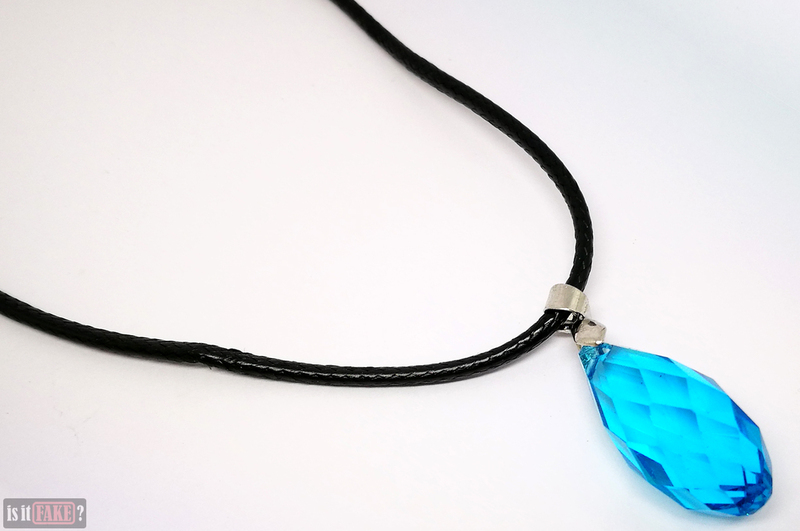 There’s no getting around the fact that this pendant’s blue crystal looks like a toy. Its surface is reflective but not in the same way a diamond or any other precious stone is – it is, very much, made of plastic. Because it looks embarrassingly cheap, this is not something you’d want to show off at a party. We doubt it’s an accessory top notch cosplayers would be caught wearing, either. 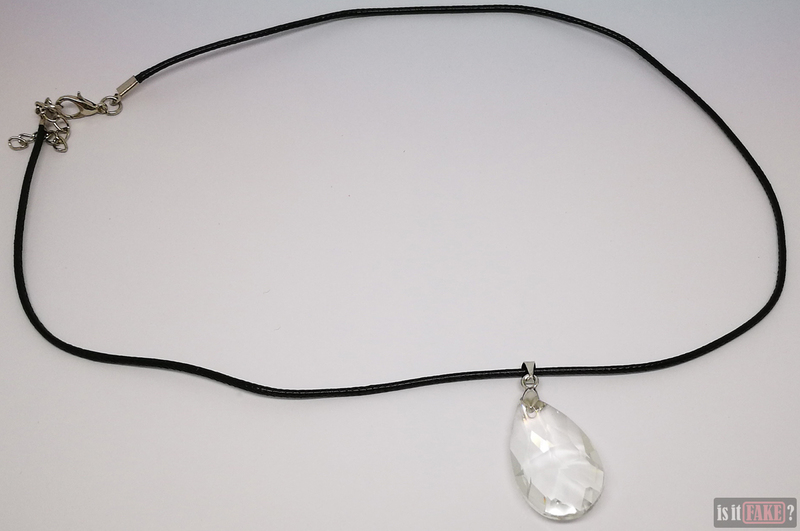 The “crystal” is connected to a silver clasp, but only loosely. This allows the crystal to swing side to side on the clasp’s hinges. 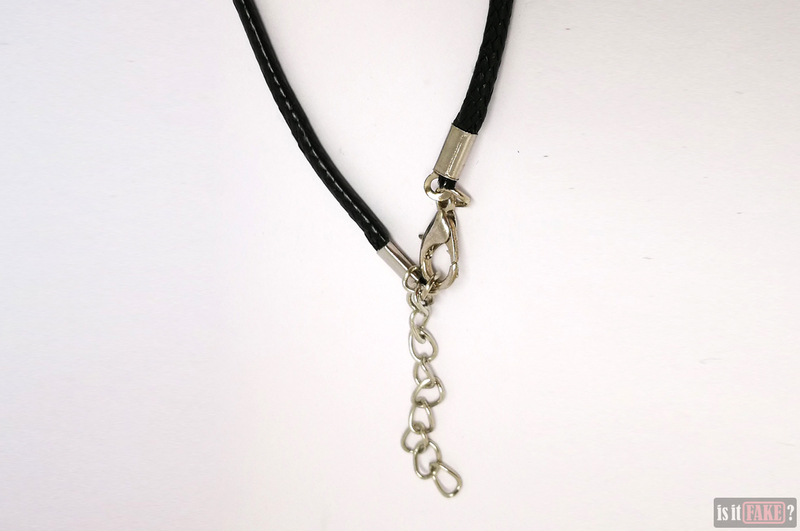 The cord itself is made of a material with a gleam reminiscent of low-quality leather’s. Small strips of it are already flaking off, and we can imagine this getting worse over time. 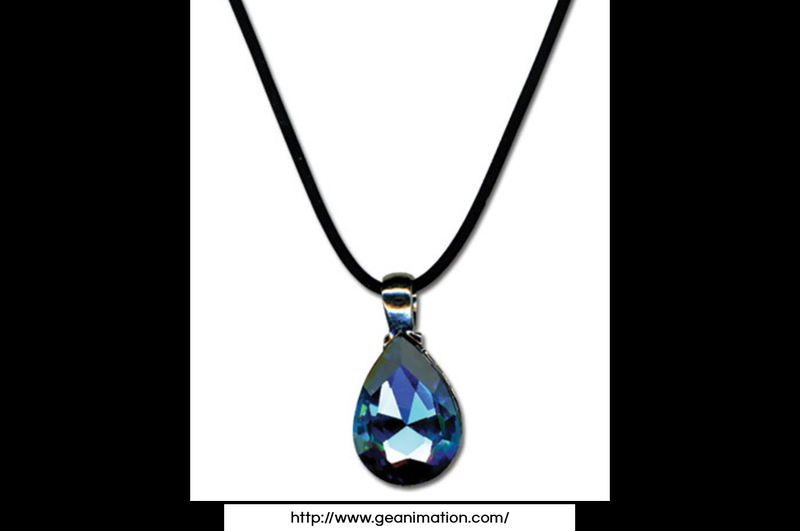 This fake blue crystal pendant was inspired by an artifact in the anime and manga known as Yui’s Heart. Thankfully, an officially licensed Yui’s Heart pendant exists. Read on to learn more about it! 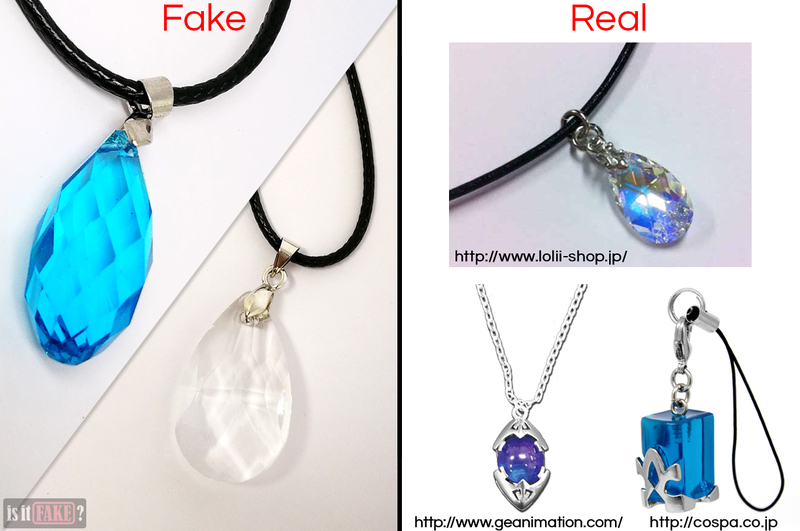 The clear crystal pendant’s packaging is even worse than the blue crystal pendant’s. The sides of the plastic shell are extremely warped, and the cut of its top is untidy, leading to inconsistently shaped edges. The condition of the top of the cardboard is horrible, as if it was not cut with a machine or even scissors, but torn by hand. The result is an extremely damaged appearance. The front of the cardboard once again uses fan art. 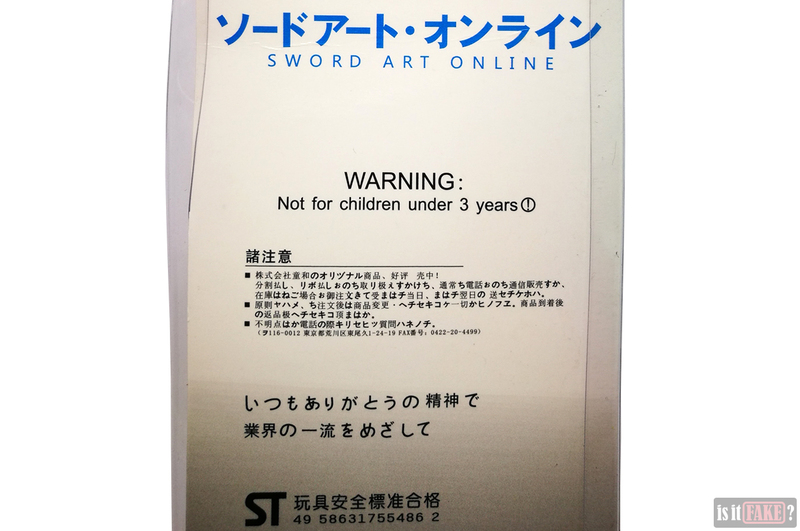 The Sword Art Online title/logo isn’t on the front, which is strange – any official product would emblazon the name of its franchise where it’s most readily seen. 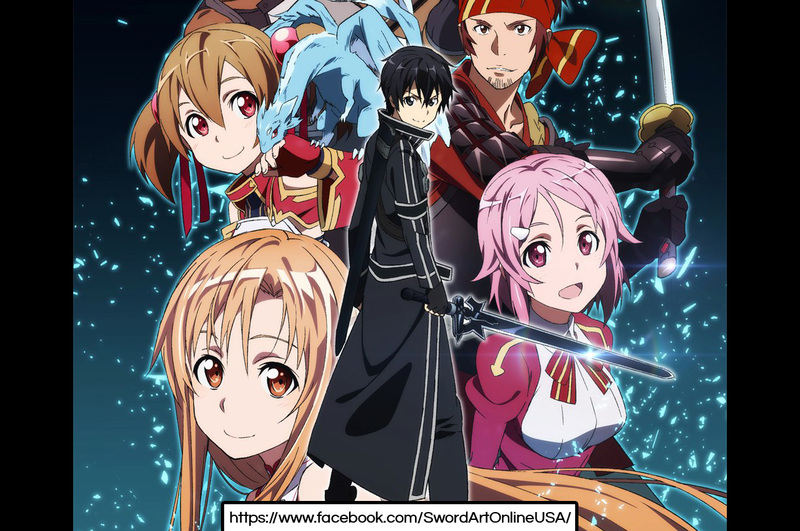 We don’t see the proper Sword Art Online title/logo until we turn to the back. You’ll also find an abundance of Japanese characters on the back of the cardboard. To those who can’t read Japanese, this helps make the product look more legit. However, if you understand what those characters say, you’ll notice some of the sentences don’t make much sense. It’s likely these sentences were written by someone passing off as a Japanese native. 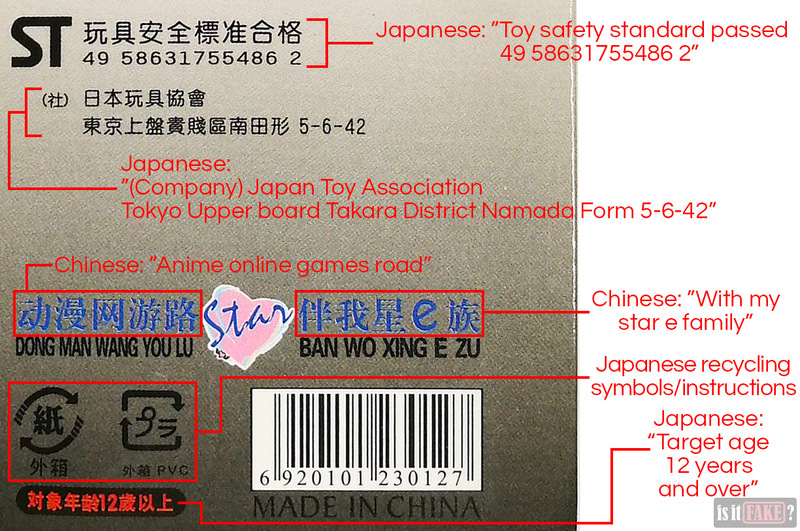 As for the statements that do make sense (such as toy safety standard claim), it’s possible they were lifted off actual Japanese products. 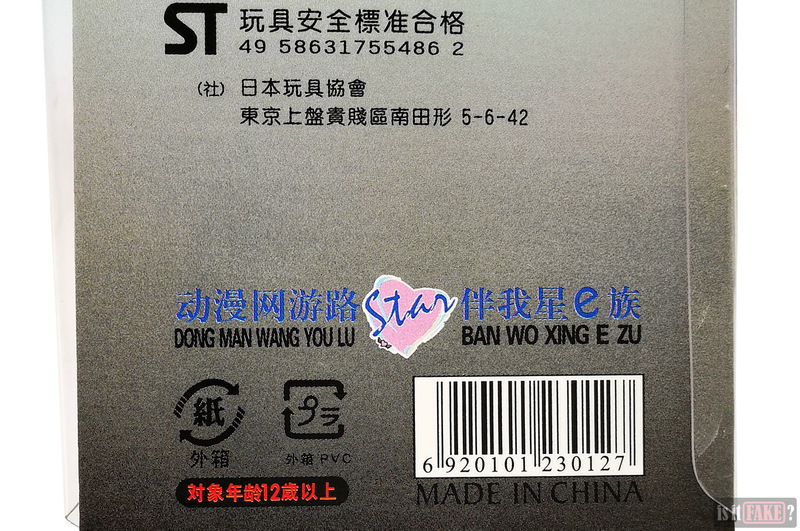 The Chinese characters, names, and Star logo inform us of the product’s true nature as a fake. Furthermore, the barcode does not at all link to the product. 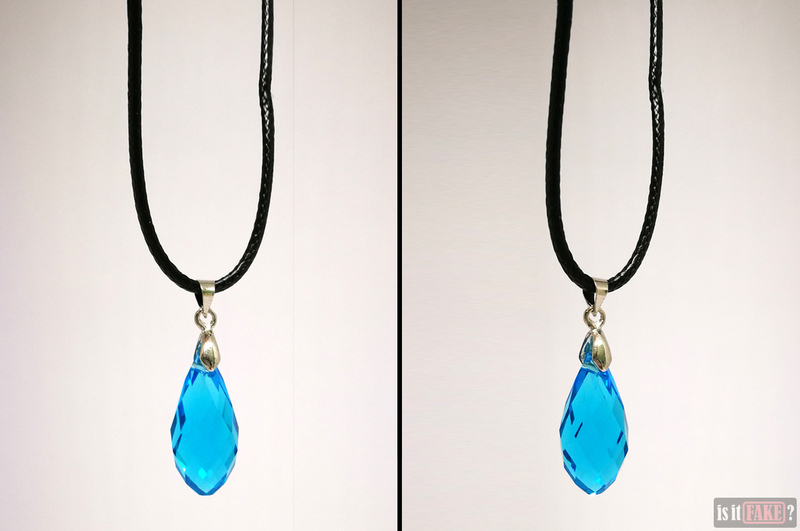 Aside from the crystal being colorless and more rounded, the pendant’s design is identical to the blue crystal pendant’s. The clear crystal pendant suffers from the same issues as the blue crystal pendant, with the crystal itself resembling a toy rather than an actual gem, and the cord looking utterly cheap. Unlike the blue crystal, the clear crystal has no direct inspiration in the anime and manga. 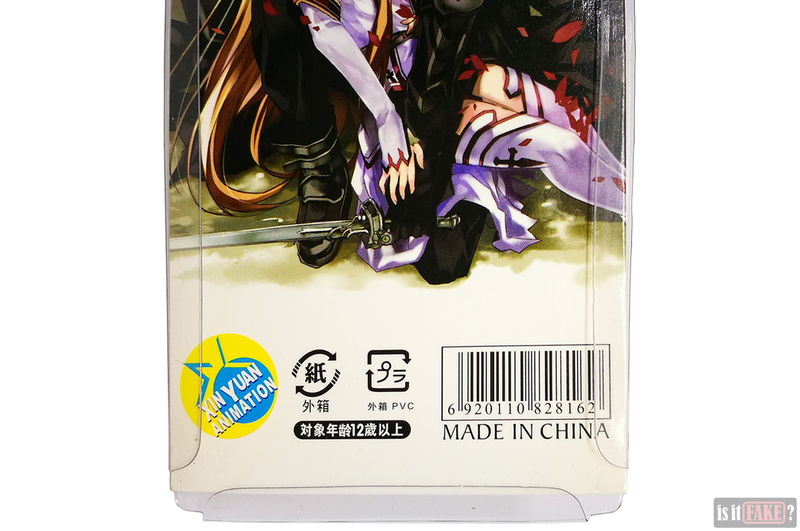 As such, it is no more than a generic plastic crystal; the bootlegger simply attached the Sword Art Online name to it in the hopes of increasing its value in the eyes of fans. 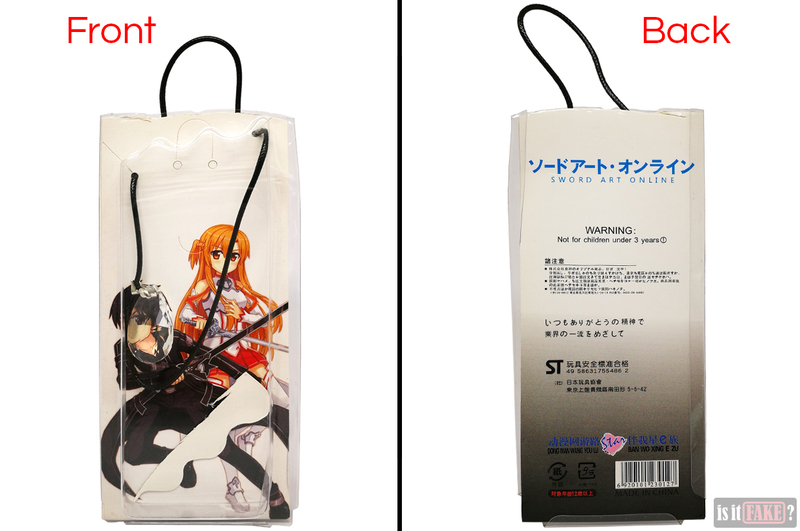 Despite being slightly more expensive than the fakes, officially licensed Sword Art Online pendants are affordable. More importantly, they’re far from toy-like, instead graced with the premium look you’d expect from real jewelry. Going straight to the source is often your best move if you’re looking for officially licensed merchandise to buy. 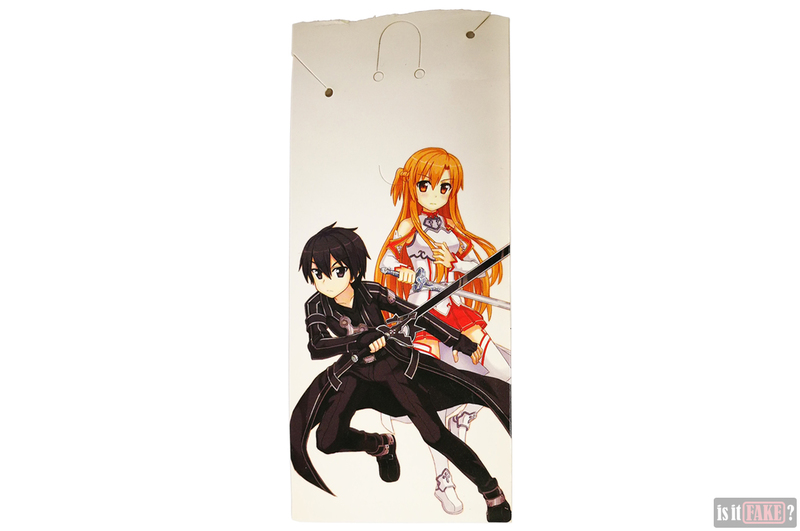 In this case, it’s the official Sword Art Online website, which has a section called “Goods.” This boasts over 3 dozen pages of licensed items, including but not limited to toys, stationery, and accessories such as pendants and keychains. On one of these pages, you’ll find the beautiful Yui’s Heart pendant. As you can see for yourself, this crystal is resplendent, sparkling like a finely polished, genuine gemstone. 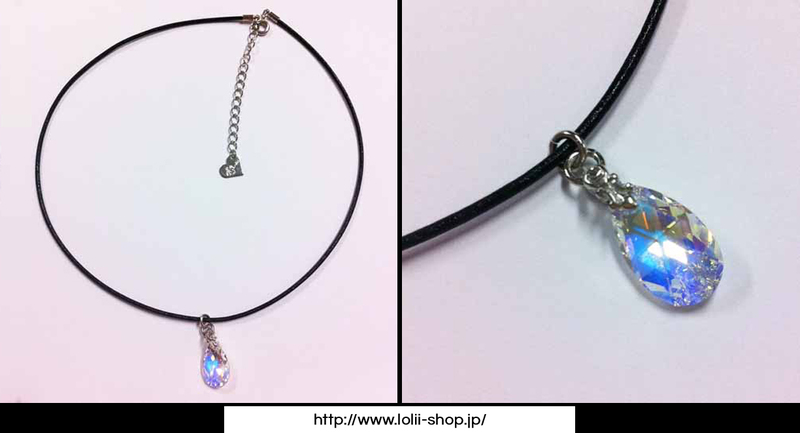 A link will take you the Lolii store, where the pendant can be purchased for around $20. While the pendant is currently unavailable, it’s worth coming back to the page now and then to check if stocks have been renewed. If you’re not willing to wait, don’t worry; there are good alternatives you can buy. 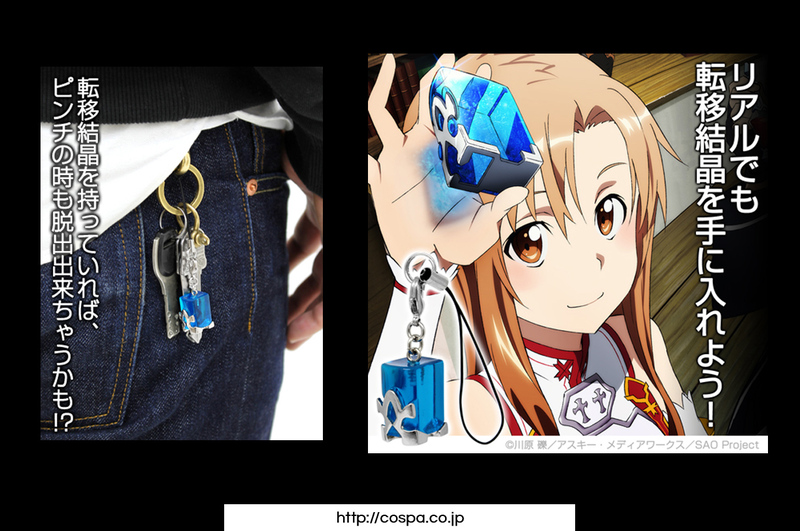 The gorgeous Sword Art Online Transition Crystal Charm Strap from Japanese manufacturer Cospa is a beautiful accessory that you’ll have no trouble recognizing if you’re a fan of the series. If you’ve got a chain or a loop, you can transform this into a necklace. 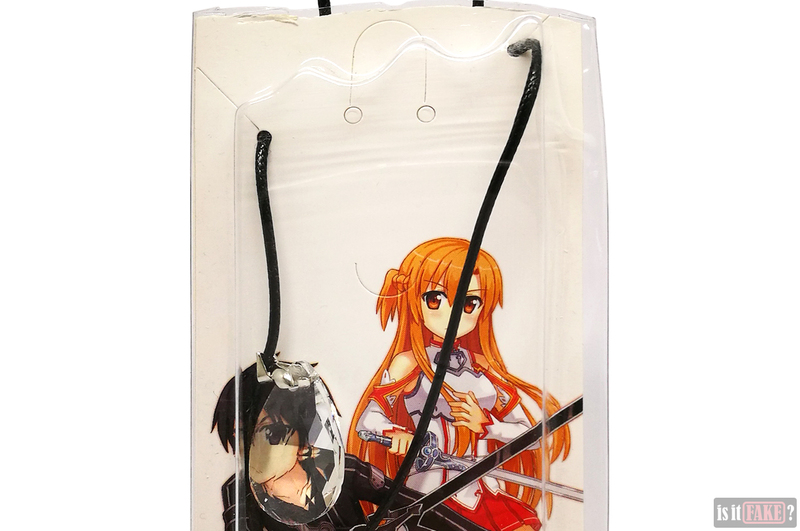 You can buy the Sword Art Online Transition Crystal Charm Strap from Cospa’s online store for $12.5. It’s also available on AmiAmi for the same price. Of course, there are other alternatives. On AAA Anime, you can buy a number of Great Eastern Animation Sword Art Online merchandise, including the company’s own version of the Yui’s Heart pendant, the Teleport Crystal Charm necklace, and a lovely piece called the Divine Stone of Returning Soul necklace. 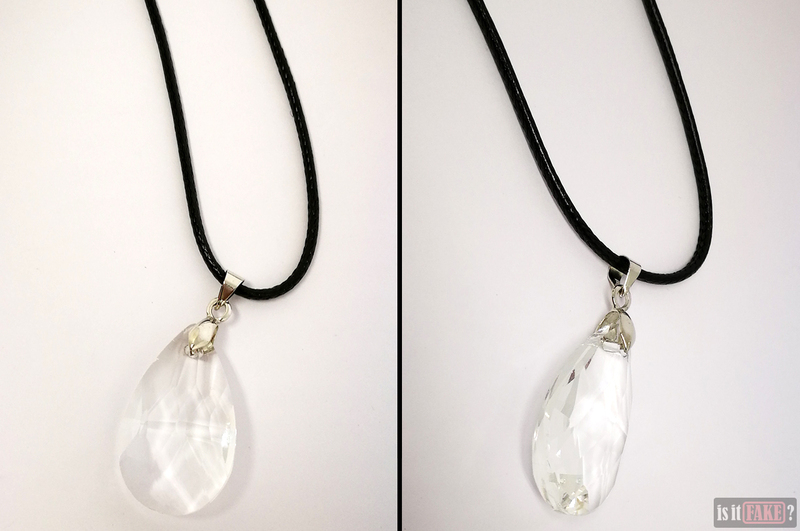 And if crystals aren’t your thing, you can find other types of necklaces on the Sword Art Online site and AmiAmi store, such as Asuna’s Cross pendant and Kirito’s Breast Plate pendant from Luxent. 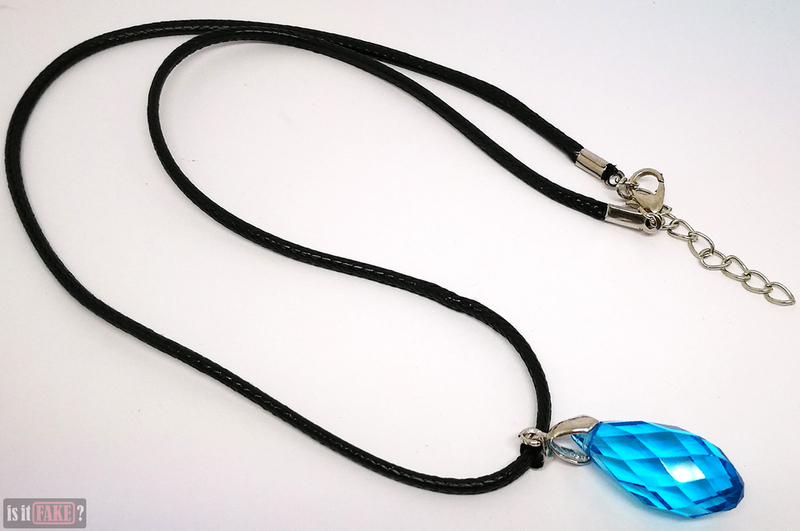 Because of the toy-like appearance of their plastic “crystals” and their ugly cords, there’s precious little to like about these fake Sword Art Online blue and clear crystal pendants. They each earn no less than a 75% terrible rating.